Peshev was a prominent politician in Bulgaria of the period before and during WW2, and in 1936 he served as Minister of Justice. On the international scene, he favored Bulgaria's alliance with Nazi Germany, in the hope that it would help the country recover the territories lost in the Balkan wars of 1912-13. 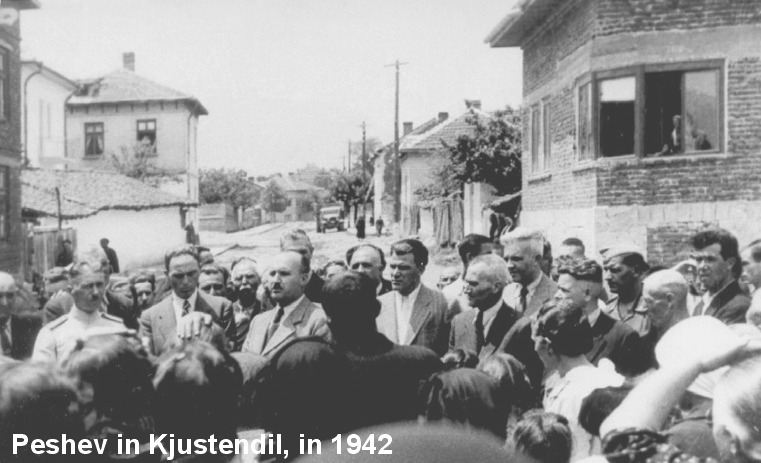 When, in March 1943, he learned that the government intended to hand over to the Germans for deportation some 8,000 Jews from Kjustendil, a town on the border of Macedonia, he decided to oppose this vigorously. Rushing into Parliament, he gathered a few members, and burst in the office of Gabrovski, the Bulgarian Minister of Interior, with a demand that the order be rescinded. After a dramatic confrontation, Gabrovski ordered that the deportation be postponed. Peshev personally called the local prefect's office to make sure that the counter-order was being obeyed. Not satisfied with this, Peshev decided to publicly denounce this and further deportations from the podium of the Parliament, where he served as vice-chairman. Drafting a letter of protest, he collected the signatures of over 40 members of parliament, addressed to the government and the king, in which he pleaded not to disgrace the name of Bulgaria by consenting to the deportation of its own citizen-Jews to Nazi concentration camps. The public protest occasioned by Peshev's posture caused the government to back down its plans to deport the country's 50,000 Jews. Peshev, however, was penalized by his dismissal as vice-chairman of the parliament. After the communist takeover, at the end of the war, Peshev was placed on trial for his participation in the previous pro-German government. His role in the saving of the country's Jews swayed the court in reducing his sentence, and he was freed after one year's imprisonment. In January 1973, Yad Vashem awarded him the title of "Righteous Among the Nations," for his role in halting the deportation of Bulgaria's Jews, at considerable risk to himself. He died that same year.